Mt. 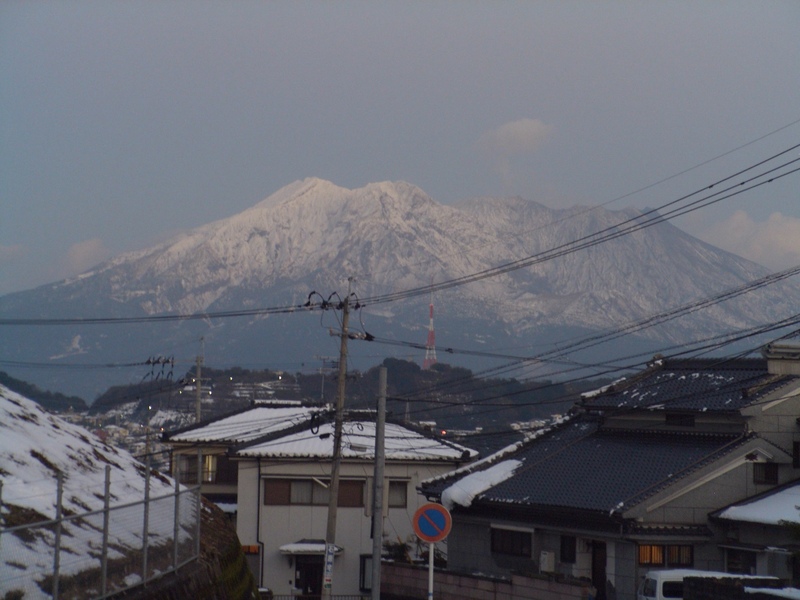 Sakurajima with a New Year's crown of snow. I’ve spent the past five New Year’s at my in-laws’ house in Kagoshima, in the southern island of Kyushu. “Family” consists of my wife’s parents, my brother-in-law (who works at a hospital and is usually on call and/or working throughout the three-day New Year’s holiday), my sister-in-law and her three children. Nenmatsu-nenshi (“year end, year beginning”) is always a bit hectic. This year with four children in the house, things were even noisier than they have been in previous years.Luckily it snowed on New Year’s Eve and Day. I say luckily, because it gave us all something to do outside the house with the kids. Between 25 and 30 centimeters (about 10 to 12 inches) fell, resulting in snowmen (yuki-daruma, or “snow-Bodhidharma”) in people’s front yards and driveways up and down the streets. It was the biggest snowfall in the area in over two decades, and almost brought the city to a standstill. No snowplows in this part of the country. Most residents do have shovels, though — for volcanic ash that periodically rains down from nearby Mt. Sakurajima, the world’s most active volcano (over 1,000 eruptions last year, a new record). Dealing with the occasional downpour of gray soot no doubt helped Kagoshima residents deal with snarled traffic and unplowed city streets without complaint. Playing in the snow with my wife’s niece and nephews, with my daughter occasionally running back and forth in the snowy front garden area between my wife, my mother-in-law, and me, served to remind me not only how much my daughter was still not quite capable of doing at the age of 20 months, but also how much she had grown and was actually capable of since thew previous holiday season. Whereas last January she had just figured out how to sit upright, this year she was careening about in the outside yard, picking up chunks of snow in her bare hands and chucking it at people. My niece and nephews were also thrilled that my daughter was talking…although they had a hard time figuring out exactly what she was saying (a mixture of Japanese, English, and her own language — “isshi ya-chi” is a good example, meaning, near as we can figure, “I want this.”). Eight months old (last year) and 20 months old (this year) are very different. I’m sure next year (2 1/2 years old) will be even more so. On the third day, we went to the Hirakawa Zoo, ranked 7th in the country. It was bone-chilling cold, and more than half the zoo enclosures were under construction. But we were pleasantly surprised by the difference between a zoo in the countryside and one in a big city such as Osaka or Nagoya. The animals actually behaved normally, for example. My daughter is obsessed with giraffes and elephants, but upon seeing them up close seemed a bit intimated. Who wouldn’t? The giraffes in particular were simply gigantic. My wife and I actually got a chance to see another giraffe on January 5th, when we went to the Kinoshita Circus during its first appearance in Kagoshima for over 40 years. My wife’s parents watched our daughter to give us a few hours at the circus. Strangely enough, it was my first time, ever, to go to a circus, anywhere. At the start of the 11 a.m. show, I half-regretted not bringing our daughter, but halfway through the “lion-taming” sketch (with 8 lions staring balefully at an audience they no doubt wished to play with as a house cat plays with mice), I realized that my daughter still was too young for some things. All things in time. She’ll be two years old soon. In a way, this New Years was probably a helpful preview of the ones to come, in which she’ll play a more and more active role. This entry was posted in family outings, festivals, holidays, inlaws, parenting, Paternity leave, Uncategorized and tagged child-raising, fatherhood, Japan, Japanese, Japanese holidays, New Year, Sakurajima, shogatsu. Bookmark the permalink. Always enjoy reading the blog, but I think you made a mistake on your numbers. 15yen is juu-go-en, not juu-en, and 55 yen is go-juu-go-en, not go-juu-en. Write…oops…right you are. I should have proofread more carefully. Thanks for the catch!